According to the press release today, Sprint just annoounced Wholesale Mobile Integration. Not true. Last October at Broadsoft Connections, Sprint was talking about MVNO options like this. At the Channel Partners Expo in Vegas in february, I tracked down the Sprint Product Manager for this offering. It was May before they sent me the first slide deck about the 3 different offerings. It was September when they finally sent me pricing - even though I consult with many Broadsoft based ITSP's it still took 7 months. And the pricing examples are wrong in the slide deck. Um, Mr. Hesse, do you see why your company needs a new CEO? These kinds of organizational problems start at the C-Suite. They did have time to launch a website. Straight MVNO, which is wholesale purchasing of data by the KB, minutes of use, and SMS messages. The carrier is paying for each KD, text and minute of use. Plus activations and monthly per handset charges. Also, the carrier has to do its own handset fulfillment. That's right: go get your own handsets, configure them correctly, handle RMA (returns), and tech support. Then there is the billing. Option 2 is to use a MVNE - a middle man. They can handle the handsets and some other stuff, but there really isn't that much margin for a middle man. Option 3 is "Leveraging Sprint's CDMA, IMS, and IP platforms to integrate mobile handsets with a Wholesale Partner's managed VoIP (prem-based or hosted) service." 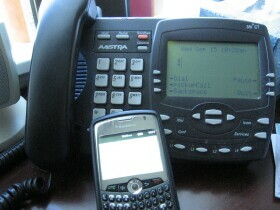 This is the Wireless Integration Service for Broadsoft based VoIP Providers (or MITEL). It consists of an MPLS connection into Sprint's IMS from the feature server that will allow registered cellular phones to act like an extension on the Broadsoft system. Every call goes through the Broadsoft switch. It will be interesting to see how this evolves because most carriers can't wrap their head around Hosted PBX let alone wireless integration of Hosted PBX. And now it's a longer sale as you start talking about cellular and desk phones and PBX and landlines. It will be interesting to watch. As an aside, I find this funny from Sprint's slides: "Devices do not drive decisions--57% say they do NOT select a provider based on wireless devices. The key considerations in provider selection are Network Reliability (92% Very Important), Cost (87%), and Network Speed (82%)." Then 43% of the people DO select by device. Can you say iPhone? Android? Lightyear is a big Sprint Wholesale customer, but mainly wireline, although they are reselling Sprint MVNO service as Lightyear Wireless. See the video of the Lightyear CEO. The main reason for a CLEC to go MVNO is not for more profit but for a grab at Total Telecom Spend. Many DSL resellers always talk about cash flow and gross profit (mainly because if they had to talk about net profit on DSL, they would cry). The MVNO route is about getting deeper into the customer's telecom budget, reducing churn, and finding ways to create bundles of services that differentiate you. On the other hand, this will complicate things for your organization (going mobile). It is not for the faint of heart or for companies without at least 5000 billing clients or for companies without a competent CFO (to watch the billing - in and out - and who can reconcile the pricing to at least make a buck off MVNO plans). Cricket signed with Sprint to go nation-wide. Walmart is selling $45 unlimited plans. Best Buy just did a deal with Clearwire. Cbeyond has a deal with Clearwire and I think Sprint's original MVNO plan. VZW and ATT are battling it out for net additions to cellular as it's a big Wall Street metric. PNG tried it. MetTel is reselling VZW. Lightyear, WOW, and Touchtone have all ventured into the cellular game, I don't hear any cheering. So while MVNO is available, it may not be for your company.